I first heard of Burns Family Studios back in 2010 when our distributor told us about their first movie Pendragon. I started following their filmmaking and was excited to hear that they were working on a Revolutionary War period drama. I love American history so I couldn’t wait to see what they would do with it. I wasn’t disappointed. I had high hopes for the movie, but even so, it exceeded my expectations. Over four years in the making, it exemplifies excellence in filmmaking. 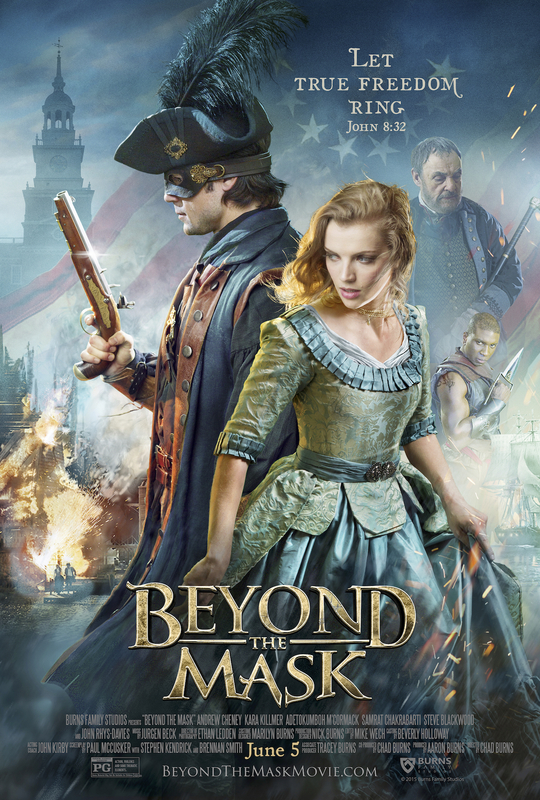 Beyond the Mask is the story of Will Reynolds, the leading mercenary for the British East India Company, who has just been double-crossed and now is on the run in the American Colonies. Working to redeem his name and win back the affections of the woman with whom he’s never been fully truthful, Will hides behind a new mask in hopes of thwarting his former employer. As his past life closes in on him, Will must somehow gain the trust and the help of his beloved Charlotte – as well as Ben Franklin – while he races against time to defuse a plot of historical proportions. As a lover of history, I appreciate the attention to detail that Paul McCusker took in making sure that the film accurately portrayed history and brought it to life. I also appreciate the work of the wardrobe, location, and props teams in creating period correct details. The writing, the acting, the cinematography, the musical score, everything about Beyond the Mask is done to the highest of standards. It’s an action packed love story that will appeal both to men and women, boys and girls of all ages. It can hold its own with Hollywood movies and can be enjoyed by both secular and Christian audiences. Beyond the Mask is coming to theaters this Friday and is definitely a must-see event. To learn more, visit the website. I saw the film. It is one of the best christian films ever made, and it’s a whole new kind of christian film too.